Senillos Tulnus is an Imperial knight and the man in overall charge of the Imperial Legion in Firewatch. Under his command are Herdonia Varan, in charge of the garrison in the main city, and Timeo Callonus, who looks after the troops in the Hill Bastion just outside of town. He is also interested in hearing about any Dark Brotherhood activity in his jurisdiction. 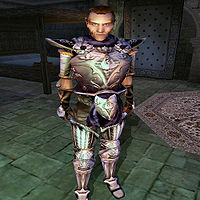 If you have been attacked by the Dark Brotherhood, you can talk to him and he will direct you to speak to Garrus Melorus about transport to Mournhold. Doing so will also cause an end to the attack. This page was last modified on 6 March 2019, at 08:49.